ABOUT 3,000 Roman Catholic faithful gathered in Limasawa Island in Southern Leyte for this year’s 498th first mass celebration Sunday, March 31. “Almost 500 years ago, they just said the mass with few people. It was like a seed put in the soil. Now, that seed has become a big tree,” said Most Reverend Gabriele Giordano Caccia, Apostolic Nuncio to the Philippines. “The presence of the Church and the presence of Christianity has shaped this country and the entire world,” he added. “Who knew at that time that in a remote island in the Pacific somebody was saying the mass? Back there, they did not even know that there were lands and islands here,” he said. “We are grateful to those who came. But as they came, they went. But faith stays,” added Caccia in his homily. 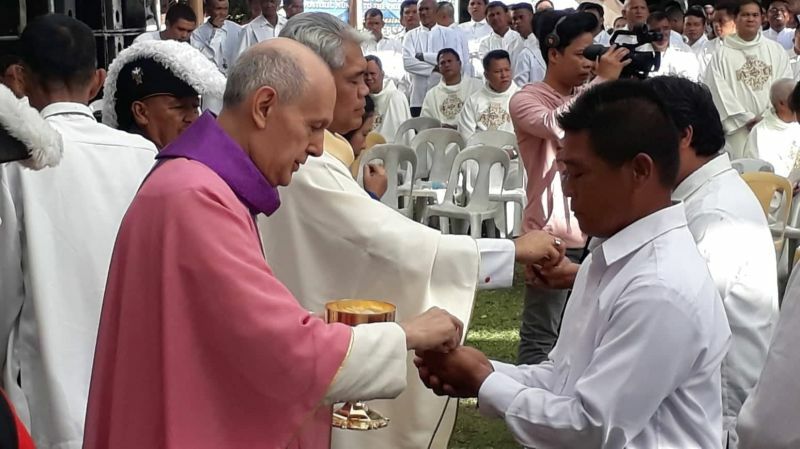 Caccia led the holy mass together with Maasin Bishop Precioso Cantillas, Palo Archbishop John Du, Cebu Archbishop Jose Palma, diocese priests, and other religious groups. The mass was also attended by Southern Leyte Representative Roger Mercado, Governor Damian Mercado, and other local officials. Rommel Labastida said he is “happy and excited” to join the celebration. “The first mass activity strengthens my religion,” said the 34-year-old parent from Limasawa. “As a youth leader, we are looking at this celebration as a stepping stone for our youths to further understand and embrace their Catholic belief,” Tampos told Sunstar Philippines. Tampos, who traveled with other youths from Maasin City to Limasawa, said their presence is also a sign of support to the claim of Southern Leyte that the first mass had occurred in Limasawa and not in Masao, Butuan. “We’re now trying to drumbeat the activities on an escalating level in anticipation of the 500th year celebration of the first mass on 2021,” said Karen Tiopes, regional director of Department of Tourism (DOT)-Eastern Visayas. She said majority of the visitors on the island are pilgrims, noting that part of the celebration is the visit of Sto. Nino image of Cebu City to Limasawa. Tiopes maintained that Limasawa is an “icon destination in historical tourism” because of the first encounter of the East and West. “We even say, this event actually gave birth to tourism. Because this is where the first cultural encounter happened between the natives who were here in Limasawa and the Westerners who were part of the fleet of Magellan,” Tiopes said. “Limasawa is blessed with natural wonders. It has pristine water, rich marine life. The best dive sites in Sogod Bay is found here. There is lagoon in another side of the island which makes you feel like you’re in a paradise because of its beauty,” she said. According to the tourism director, they were able to train and develop 41 households for “homestay program” to help accommodate visitors on the island. “We only have few accommodation facilities. Visitors on the island would also expect to go camping,” said Tiopes. Since there is no star-rated hotel on the island yet, Tiopes said that accommodation in Limasawa is “very affordable." However, part of their job is to hone the skills of the tourism service providers and check on their services to see more room for improvement. “As far as DOT is concerned, we’re also here to observe and to project the number of visitors on 2021, and to see in what manner we, together with the Southern Leyte provincial government, the local government of Limasawa and the church, can work together to prepare the island to the larger influx of visitors on 2021,” Tiopes said. While she talked about the government’s plan to enhance the replica cross and other structures in Limasawa, Tiopes also looked forward that the controversy surrounding the first mass will end the soonest time. “For the longest time, there has been that controversy. We leave that to the experts. We hope and pray that this issue will be put to rest so both people in Southern Leyte and Butuan will finally have peace of mind and no longer be squabbling on this issue. Leyte-based historian Rolando Borrinaga said he is already inching towards solving the controversy as he is set to deliver his latest research with the National Quincentennial Committee of the National Historical Commission of the Philippines on April 25 to 27, 2019 in Limasawa and Maasin City. According to his study, Borrinaga pointed out that Limasawa was the site of the first mass.